President John F. Kennedy was killed on this day, Nov.22, in 1963. A rare and morbid metal souvenir building of the assassination area was created the year after the tragic event. About six versions seem to have been created and are slightly different. All are a desk sets, but one has a pen holder and the other a well for pins or paper clips. 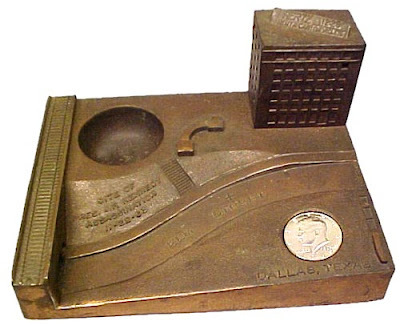 The inscription reads "Assassination Site of President John F. Kennedy Nov 22, 1963.” The Texas School Book Depository building is in the upper right corner with a Hertz Rent-A-Car Chevrolets sign on the top with a clock displaying the time of 12:29. Elm Street has an X to mark the spot where Kennedy was hit. The grassy knoll area, type reads "Dallas Texas." Elm Street goes under a railroad bridge on the left. The Book Depository is at Houston St. on the right. A 1963 John F. Kennedy coin is mounted in the metal. The bronze-finish metal replica measures 5.75" by 7.5" and 7" tall. A maker mark on the bottom says Edward R. Reed 1964 Historical Enterprises, Inc. 707 W. Davis, Dallas TX. Estimated numbers produced rage from 100 to 1000. The Late Dixie Trainer, an avid building collector, wrote an article about this building replica and called it, “The Strangest Souvenir Building Ever Made.” It seems 1964, as now, theses replicas are a controversial souvenirs. I have one of these that has a flex lamp built onto it. From what I hear there may only be a few of these in existence. I've never seen another like it. Any info? HI Josh, Mostly I've seen the version with a pen holder. The lamp version must be more unusual. Can you send me a photo of it? Address is in my "about" page.